UTE Engineering with over 12 years of experience in deployment of 6 Sigma methodology responded to a request from the Institute of Engineers Sri Lanka [IESL] to conduct Green Belt Training in 6 Sigma which is the first step to becoming more effective and efficient in identifying root causes of problems, analysing and identifying the best possible solutions and developing processes to eliminate errors. UTE Engineering 6 Sigma Master Black Belt Mr. Tharaka Dayabandara conducted this training with the objective of exposing young engineers to basics of Six Sigma and enable them to develop and manage measurement-based strategy, which focuses on process improvement and variation reduction through the application of Six Sigma knowledge. A big part of the training is to know how to gather all relevant data based on factual evidence as the first step in making the improvements. Mr. Sudarshan Karunaratna- Director Operations of Litro Gas. “By helping future engineers to benefit from UTE’s 70 years of experience in providing the best engineering solutions we have taken our service to the next level,” stated Riyad Ismail, CEO of UTE. 21 Green Belts received their Certificates at a ceremony held at UTE Premises on 4th January 2018 in the presence of the CEO and Top Management of UTE. 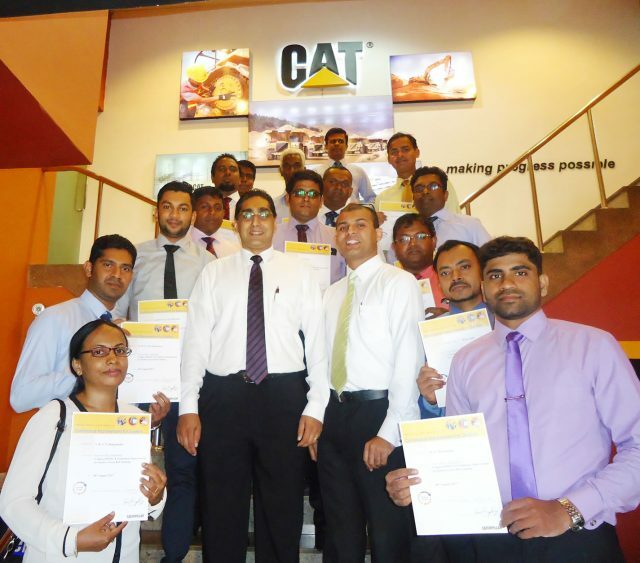 These certificates were endorsed by Mr Jim Umpleby, CEO, Caterpillar Inc. USA.